Alot of people have been asking if we're starting a Daniel Hudson player collection. The answer is no. He's a rising star on our favorite team and his certs are going for just a few bucks right now. So not really a player collection, just a collection of cards of a player we really like. 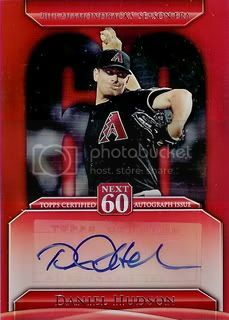 Day two of the "Five Days of Daniel Hudson" brings us a nice auto from the 2011 Topps Update set. This one is from their Next 60 insert set. Nice follow-up to their Topps 60 set from Series 1 and 2. I like the way the red border compliments Daniel's D-Backs jersey. The red background on this is awesome! Sweet card!